A rare old bottle from Cadenhead's Authentic Collection released for the bottler's 150th anniversary. This was distilled in 1963 and bottled unfiltered and at natural cask strength in 1991. In terms of barrel ageing, this is one of the oldest bottles of Jameson we have ever seen. 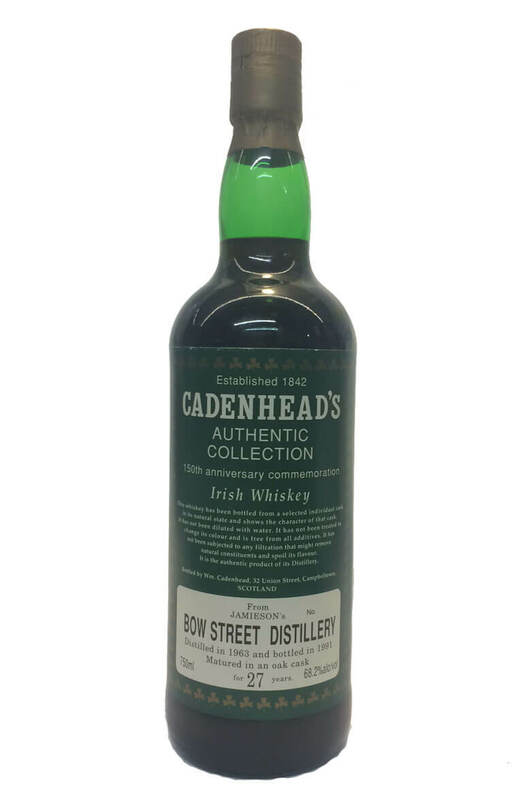 Cadenhead are highly respected independent bottlers and it seems that at some point in the 1960s they picked up a batch of barrels from distilleries that had already closed, or were destined to close some years later. In the same series there were bottled from other long gone distilleries such as Daly's in Tullamore and DWD's Jones' Road Distillery. This Jameson (note the misspelling on the label) is a beautiful rich and oaky single pot still whiskey, most likely matured in a sherry cask. Even for a 27-year-old it is very dark.